Today I want to talk about the tapping technique. The basic idea is that I’m not going to let go of my pick. one-finger tapping for now. I’m using my middle finger. as little patterns go. Then you can do this; you can descend down. over on that string. I’m staying in the pentatonic the whole time. 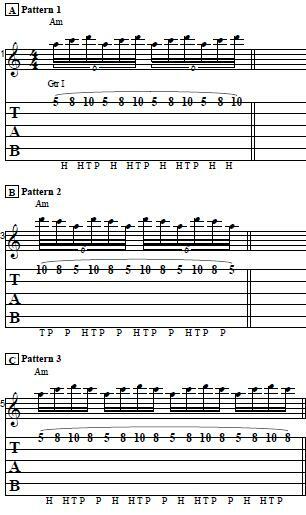 I talk about patterns like these in Super Charged Soloing Made Simple. okay, I’m playing normally, now I’m going to try some crazy tapping thing. It should just be an extension as much as possible. which you can check-out at guitarcontrol.com/supercharge. Check it out and have an awesome day. I’ll catch you later. Take care. You don’t need any special amp settings some people tap on acoustic guitar as demoed on Spanish Fly by VanHalen. 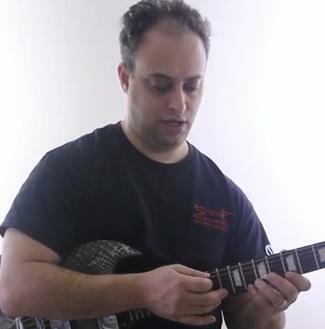 Sustain and distortion seem to make most riffs a little more edgy but if you do it clean and precise it will sound good, and that is also necessary with sustain and distortion. Tapping is nothing more than an extension of hammer-ons and pull-offs, and so they can even be played acoustically – no special settings or effects are required. In fact, I encourage players to play with a clean channel when first learning any new technique. For my soloing i like to use either Reverb set for a small hall, or Tape Echo plus a splash of Chorus. to me it gives it a fuller sound. Great starter lesson Claude! Next time can you show tapping above chords? These two techniques together could open a whole other world for some of us! Rock on!! So, tapping is like extended hammering using the picking hand. I never knew that. It always looked mystical to me. Thanks for that demo. Though I’m not sure I see tapping in my repertoire any time soon. Ok Claude, the second I heard the key in Guitar Shredding, I just KNOW that’s the key of one of my ALL TIME favorite songs….Europa by Carlos Santana! Any chance you could give me any hints on THAT song????!!!! Ya know, if you were to hit the 12th fret, it would sound even cooler! Tell you students if they want to do the tapping technique without a lot of effort, set the amp to a lot of “sustortion”. But cleaner tapping requires more of a quick pull-away “whack” technique…..from the jazz guys who actually invented the technique several decades ago! Hey Claude ! Pretty cool lesson…. Finger-tapping demystified. Thank you, Claude. Love it !! Where do I get more of this style .Do you have DVDs ? I really don’t like the tapping it gets me lost hahahahahaha.